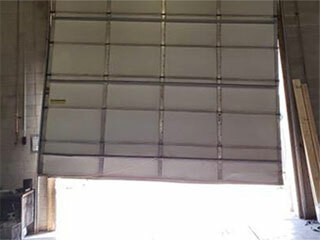 A lot of things can lead to garage door malfunctions, and it can be difficult to figure out exactly what's wrong. For example, if you push the button on your remote control and the motor unit seems to run smoothly as usual, but the door doesn’t close all the way. It can be hard to determine exactly which part is at fault, but familiarizing yourself with the common issue can help you recognize the situation quickly and make sure that it is addressed properly before the problem is exacerbated. If the door moves down extremely slowly and you have to lock it in order to keep it fully closed, then the springs may need to be adjusted to mitigate this. You can make sure of this with a simple test. Disengage the opener and lift the door halfway up by hand. If it drops down after you release it, then spring adjustment will be required. This task can be very dangerous, so you should let our experts handle it. Problems with these components will often cause the door to jam. Lodged pebbles or sticky dirt may prevent the rollers from moving, and on rare occasions will also cause the door to get off track. While blockages can be removed by hand, dirt accumulations will require treatment with a mild solvent. Less often, the door could get jammed because the vertical and horizontal sections of one or both tracks are misaligned. Adjusting their position and tightening the bolts will eliminate the problem. If the track is bent, it will require straightening, which needs to be performed carefully to avoid damaging it further. Sometimes, complete track replacement will be required. We can help you regardless of how complex the problem may seem. If the door is hanging to one side above the floor, it's very likely that a cable broke. This is easily confirmed with a quick visual inspection. If you do find that the lift cables are at fault, the damaged unit should be replaced with a new one of the exact same size as quickly as possible. The second cable should be inspected for fraying and cuts. If any of these are present, it will be best for it to be replaced as well. If the door reverses automatically when it starts going down, the safety sensors might not be working properly. It makes sense to check the tracks and cables first, however. If these hardware parts are intact, then the issue is most likely with the photo eyes. You should clean them and make sure their LED light is steady and not blinking, to ensure their alignment is correct. If you can't locate the source of the problem, or you can but are unsure as to how to deal with it, contact our team at Garage Door Repair Greenwich and we'll quickly take care of it.